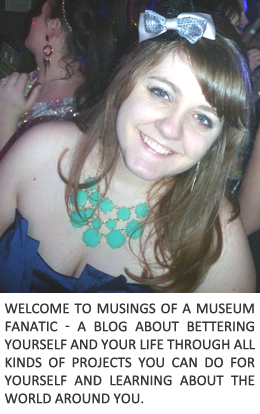 Musings of a Museum Fanatic: Crap! This week has been crap! Now I know I always seem to be the upbeat girl and I always try to be that way but this week has been ridiculous. The entire week wasn't utter crap but it seems like every day had multiple crappy things that have just added up to me being completely stressed out and upset. Today it was realized that we didn't have anything for one of Kevin's grandmothers. Now I know at one point there was a really good idea cause this year I was baller and had great ideas for everyone. At this moment I still cannot for the life of me remember what the heck my brilliant idea was. Being a quick thinker I realized I could make a cute little ornament fast this weekend, it's one that's been popping up on pinterest lately so I'll be sure to share mine later this week! So I have what I want to do but it's going to be quite time consuming this weekend. Rejected from three jobs today. The job area of my life has been super frustrating lately. Don't get me wrong I am super grateful to actually have some work and to be paid well for it but I am definitely underemployed. The thing that just really gets me down about my situation is that I've worked very hard the past four years in my field. I have had internships and been gaining experience from some of the best museums in the Chicagoland area. It's such a cliche but I am a hard worker and am good at what I do! I do not get it. In addition to my job woes this week. Today I found out that the library cd I have in my computer is stuck. Took it to the Geek Squad and they would have to send it out cause they have to take apart almost the whole darn thing. *SIGH* Stick my hand back in my purse after this news, get stabbed under my fingernail with a staple. New Follower. I totally understand the job thing. I have a master's in historic preservation and when my husband and I lived in Philadelphia, you would think I would be able to find a job in my field no problem. Nope! While I had a job, I was definitely underemployed and it was incredibly frustrating at times. I know it's cliche to say it, but the right job will come eventually if you keep at it. You're not alone! I can totally relate to the job issue as well. Stay persistent though! I actually have to stay at my job, even though I don't love it, because I can't find anything else in the field or I am simply not qualified for my dream jobs because I don't have an undergrad in art history, etc. I may switch careers soon and waste my Masters in Museum Studies completely, which is disappointing.